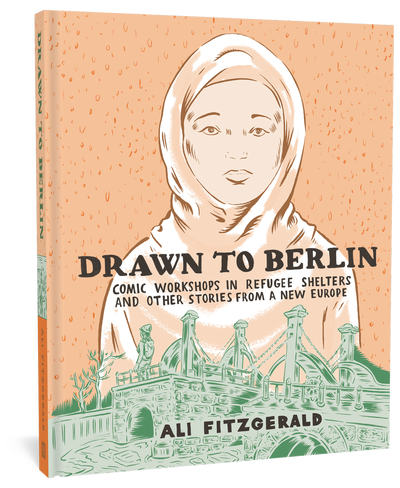 Tags: Ali Fitzgerald, comics, Drawn to Berlin, fantagraphics, graphic novel. Toronto-based cartoonist Georgia Webber’s new book, Dumb (Fantagraphics Books), Part memoir, part medical cautionary tale, Dumb tells the story of how the book’s author copes with the everyday challenges that come with voicelessness. Webber adroitly uses the comics medium to convey the practical hurdles she faced as well as the fear and dread that accompanied her increasingly lonely journey to regain her life. Her raw cartooning style, occasionally devolving into chaotic scribbles, splotches of ink, and overlapping montages, perfectly captures her frustration and anxiety. But her ordeal ultimately becomes a hopeful story. Throughout, she learns to lean on the support of her close friends, finds self-expression in creating comics, and comes to understand and appreciate how deeply her voice and identity are intertwined. Georgia Webber is a cartoonist living in Toronto, where she is a freelance comics in addition to editing the comics section of carte blanche. She is best known for Dumb, her autobiographical comics series about living with a vocal disability. 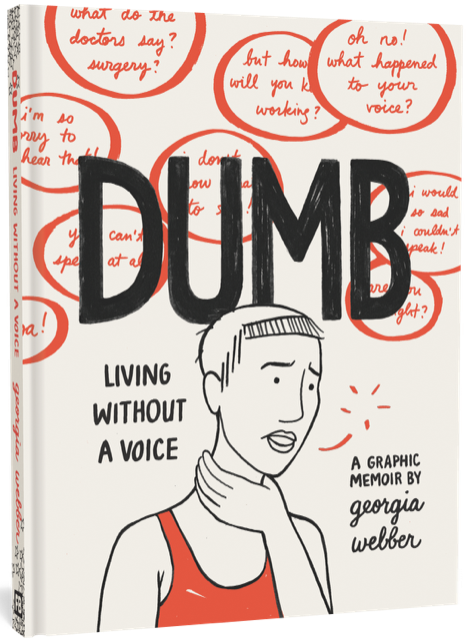 Tags: Dumb: Living Without a Voice, fantagraphics, Georgia Webber, graphic novels. 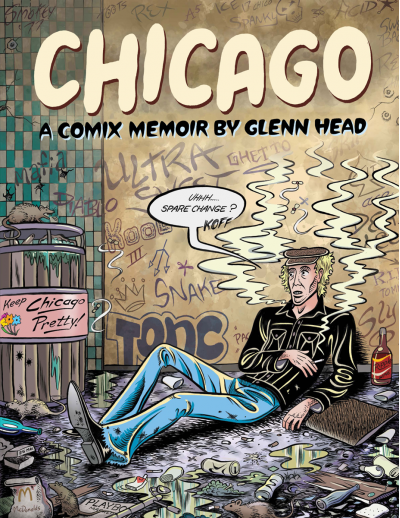 From Harvey and Eisner-nominated cartoonist and editor Glenn Head comes Chicago (from Fantagraphics Books), the hilarious and harrowing tale of a nineteen-year-old virgin who drops out of everything and into the unknown. Abandoning suburbia for art school and then the gritty streets of Chicago, young Glenn finds himself fending off street predators and fighting depression. Like Scorsese circa Mean Streets crossed with revealing autobiography like Jim Carroll’s The Basketball Diaries, Chicago is an unforgettable tale of losing one’s mind, finding one’s identity, and discovering love where it’s least expected. Glenn Head is a cartoonist living in Brooklyn, New York. He edited and contributed to the comix anthology Hotwire from 2006-2009. He will be at Quimby’s to read selections from his graphic memoir, and to speak about his creative experiences. A signing of the book will follow. Tags: chicago, fantagraphics, Glenn Head. Thanks to Fantagraphics consumer marketing/web editor/hand model guy Mike Baehr who wrote about our limited edition Chris Ware print on FLOG! 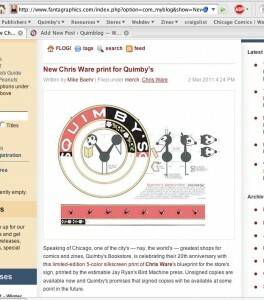 aka as the Fantagraphics Blog. Tags: bestsellers, fantagraphics, store news.